The Rumor Of Email Marketing’s Demise is Much Exaggerated. A majority of your website visitors come once and never come back again. Why would they? What do your site or your social media outlets provide that would make them come back? Any visitor that doesn’t return is a lost sales lead. Content importance boils down to providing valuable information, thought leadership or entertainment. That's it. You must provide one or more of these to have returning visitors. Email marketing is a great way to keep visitors engaged. Use a well structured email campaign with interesting industry news, new product developments, or knowledgeable case studies. This will bring visitors back to your site, allow you to gather their information and turn them into leads and sales. CMS4i will create attractive, professional HTML email templates for you. 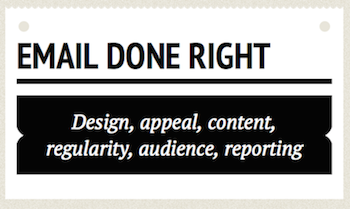 We’ll aggregate each newsletters content, set up the email sending infrastructure, and send out the email. We’ll manage your email list for removes, bounces and complaints. Most importantly, we’ll report how many opens you had and what links those email addresses visited.